Should you drink Energy Drinks? Energy Drinks were first used back in London, 1929. “Lucozade Energy” was originally used in aiding the recovery of hospital stays; to “replenish.” It was not until 1997, that the energy drink ingredients, that are used today, were presented by an Australian entrepreneur with “Red Bull.” By 2001 the energy drink industry had grown to nearly 8 million in sales. Today it is a 10 BILLION dollar market! Energy drinks are particularly attractive to young people. Approximately 66% of it’s drinkers are between 13-35 years old, with males making up 65% of that market. Energy drink generally contain methylxanthines, (including caffeine) B vitamins, and herbs. Other common ingredients are: guarana, acai, taurine and gensing. Most contain vary high levels of sugar. Most alarming ingredient is the high levels of caffeine. Energy drinks contain approximately 3 times the amount of caffeine that is in a 12 ounce cola. For example, Coca-Cola Classic contains 35mg. 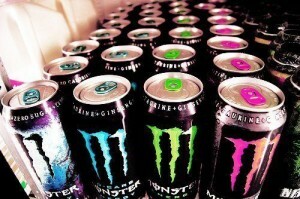 of caffeine whereas a Monster Energy Drink contains 120mg. of caffeine. The most disturbing thing to me is that people are not looking at the labels and understanding what they are drinking, and then people will have more than one a day. If you add other stimulants such as ginseng and guarana that actually contain caffeine, the adverse effects are staggering. Adverse side effects associated with consuming too much caffeine are: Sleeplessness, irritability, nervousness abnormal heart rhythms, increased urination. Pupil dilation will occur if consumed while on anti-depression medications (SSRIs). “Crash” symptoms will occur if consumed with alcohol. This is because you are consuming a stimulant with a depressant. This is detrimental to the brain and heart causing seizures and heart attacks. Thank you so much for this important information Dr. Lauren! For more information about Dr. Lauren please visit, http://www.advanced-chiro.net.